A personalized chopstick sleeve is a truly unique and fun way to present a chopsticks gift or handout for your party or event. They're a delightful and memorable little billboard to express your message and bring a smile to those who receive them. This little space can display text, colors and images - whatever can be printed - and makes a standout presentation your guests or customers will remember for a long time to come. A personalized chopstick sleeve is a printed paper sleeve that holds a pair of chopsticks. The sleeve is printed with your message and content on nice, heavy glossy paper. Your content can be a company logo, photos, text, colors and artwork - whatever can be printed and fit onto the 6-1/2 by 1-3/8 inch space. A designer takes your content and works up the design for your approval. You select from a broad selection of popular and colorful chopsticks which you can opt to have personalized too. The sleeves are then printed, hand-folded origami-style, chopsticks inserted and all are packed for delivery. From 1 to 100 year olds, personalized chopstick sleeves for birthday parties are a perennial favorite. They're a terrific way to express a happy wish or a lively roast to mark the special occasion. Often a picture of the birthday person or a wishful kanji are printed on colorful backgrounds to make a fun party gift for all the friends and family to remember the special day. Personalized chopstick sleeves are fun for holiday get togethers, special occasions, sushi parties and other happy times. Sleeves can be decorated with holiday or party related artwork and color. You can choose from several pre-made Asian themes as well to ideally suit the flavor of your party. 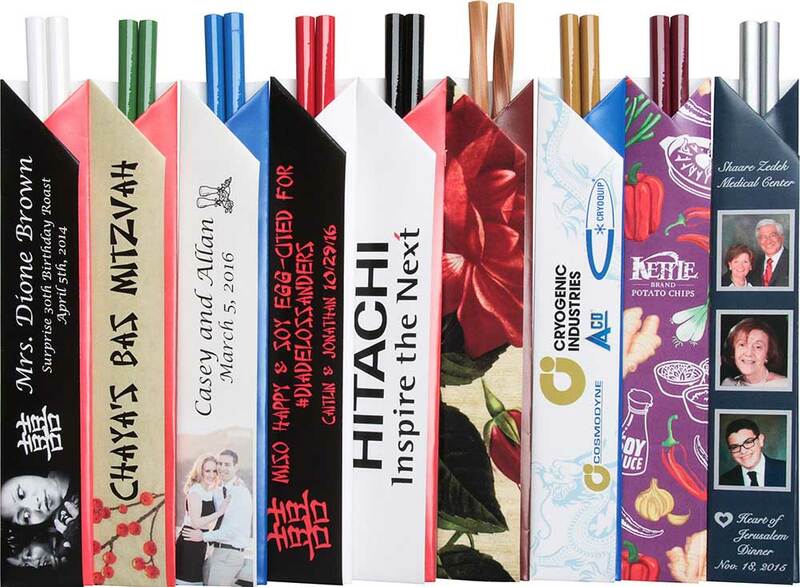 Asian theme bar and bat mitzvahs are surprisingly popular and personalized chopstick sleeves add special guest giveaway to help celebrate and remember the cherished occasion. You can add any symbols or artwork, color to suit the decor, and add your message. In Japan it is a tradition to have white wedding paper sleeves decorated with red accent color and good luck crane motifs. With personalized chopstick sleeves you can go traditional or decorate in your own wedding colors. Add special artwork or images and your message to make a truly wonderful table item for your guests. Choose chopsticks from a selection of popular wedding colors. Personalize the chopsticks for a memorable touch. For events of all kinds - book signings, business openings, anniversaries, celebrations and more - personalized chopstick sleeves can add a unique Asian flair while also delivering your message. Choose from a large selection of stock artwork or add your own logos or imagery to make a handout your guests will remember. Personalized chopstick sleeves (and personalized chopsticks!) are a fantastic Asian themed medium to advertise your message at your corporate or business event or promotion. This specialty advertising chopsticks sleeve is an excellent mini billboard, allowing complete control over the artwork, imagery and message. If you have your own internal art department and wish for them to do the design work, Adobe InDesign templates are available for their use. Otherwise our art department is staffed by wonderfully experienced and capable designers who can do the work for you at no extra charge. 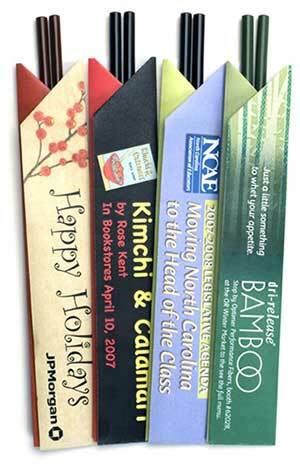 Companies large and small have used the personalized chopstick sleeves at their events as memorable handouts. (SWAG) Advertise your message with personalized chopstick sleeves at your next corporate event or promotion. If you have a business or corporate party and need and Asian themed gift, consider using personalized chopstick sleeves as a unique gift. You can color the sleeves to suit the event decor or seasonal look, add your company logo or other art, along with your message. Pair the sleeves with some beautiful chopsticks for an nice and inexpensive gift for your attendees. The regular personalized chopstick sleeves are likely not a good fit for restaurants because of their hand-made, low volume orientation. However we have restaurant disposable chopsticks with personalized sleeves available at terrific low cost. The printing is limited to 3 spot colors and simple designs. The art is printed on tissue-weight soda straw style wrapping sealing a pair of disposable bamboo chopsticks. Production time takes just a couple weeks and pricing includes shipping anywhere in the continental US.